Australian private debt has been a relatively happy hunting ground for astute institutional investors over the last decade, with a shallower pool of buyers and illiquidity premiums helping to drive higher risk-adjusted returns. With stringent bank capital adequacy regimes in place, the opportunity for institutional investors to access enhanced returns is likely to endure for some time. 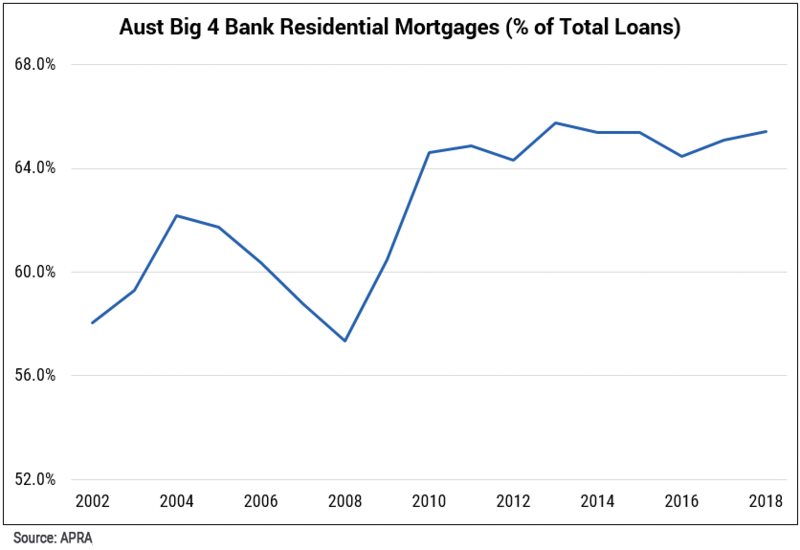 Post the GFC, and in the lead up to the adoption of tighter capital adequacy standards in 2012, Australia’s major banks significantly increased their residential mortgage books (from ~57% of lending in 2008 to ~66% today (see Chart 1)). Yet over the same period, corporate lending declined from 28% to 25% today, meaning the private debt lending books of the major banks have proportionally fallen over the past 10 years by at least $60 billion. As for the tightening of capital adequacy requirements, APRA now compels banks to set aside capital based on prescribed risk weightings, with investment grade (IG) and sub-investment grade (HY) debt requiring an additional 100% and 150% in capital compared to just 35% for residential mortgages (see Table 1). In the post-GFC environment of low impairments (see Chart 2) and tighter capital adequacy, Australia’s banks have unsurprisingly sought growth in residential mortgages over private debt in order to maximise risk-weighted returns on equity (ROE). The Financial Services Royal Commission is only reinforcing this trend, with new standards set to add to an already risk-averse mindset. So what does this mean for institutional investors? With the banks’ appetite for private debt constrained, opportunities for discerning investors to boost carry and add a layer of sustainable, defensive income are on the rise. Regulatory constraints are likely to maintain a steady pipeline of deals offering attractive return profiles and investor-friendly covenant protections (e.g. Debt/EBITA and interest cover). As fundamental and multi-sector credit investors, we see significant opportunities to earn higher risk-adjusted returns in the Australian private debt market. We currently favour 3-5 year BB-rated opportunities, which offer strong returns at Cash +350-500 bps.